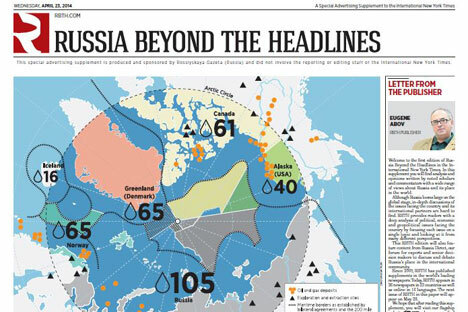 The main theme of the latest issue is devoted to the problems of development and utilization of the Arctic. On April 23, the international project of Rossiyskaya Gazeta, Russia Beyond the Headlines, launched its debut supplement distributed with the "International New York Times," which reaches a global English-language audience. Each four-page supplement will offer in-depth analysis and opinion on a single topic as well as a one-page lifestyle feature. The first issue, appearing April 23, focuses on the Arctic and features travel tips for visiting Moscow. Lara McCoy Roslof, Executive Editor for the Western Hemisphere, introduces RBTH's new supplement, which will appear monthly in the International New York Times.